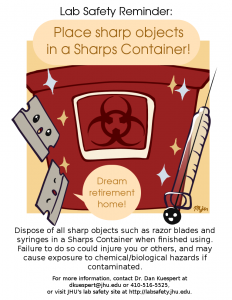 Ever wonder how to justify the time it takes to do hazard and risk assessment on your work? The American Chemical Society just posted this short video discussing the why of hazard and risk assessment (and what the difference is between them). Have a look at the video–and learn how crossing the street relates to lab experimentation. 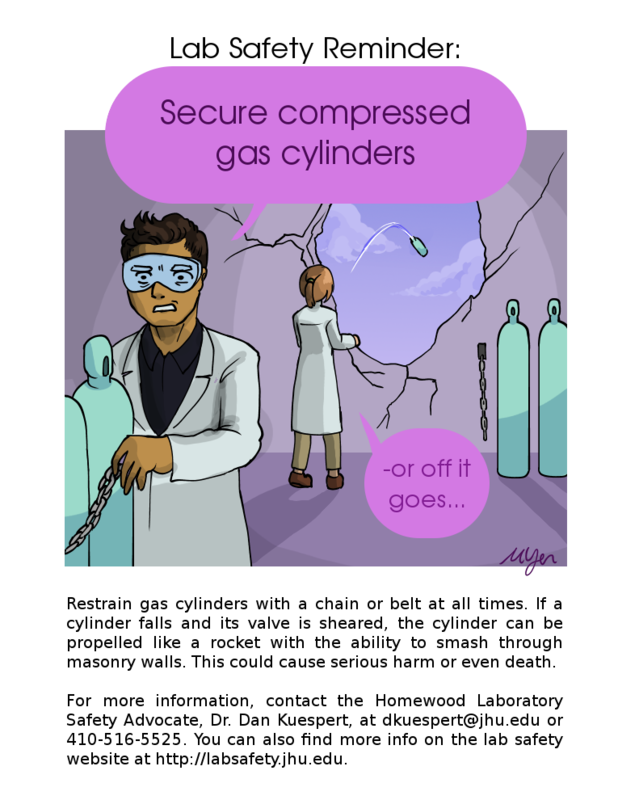 All experimental protocols have a scope—that is, every experiment has parameters such as pressure, temperature, power, force, chemical identity, etc. Many people think that performing safety analysis on an experiment is “too much trouble” because they don’t want to have to do it each and every time they change a parameter. This is not true; such people misunderstand how to use safe experimental design methods. When we plan an experiment, the range of parameters we expect—pressure ranging from 0 to 50 bar, for example, defines a set of safe operating conditions– what I like to call a sandbox. 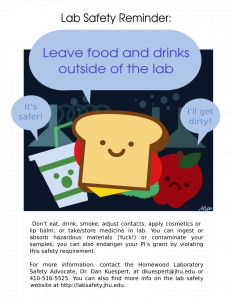 Provided you do an appropriate safety analysis for the range of safe operating conditions you expect to use in your experiment, you can do experiments anywhere within the sandbox you like. Want to move your 5 bar experiment to 15 bar? If your safe operating pressure is defined as 0—50 bar, no additional safety analysis is necessary. It is only when we leave the sandbox—vary parameters outside the range we’ve already studied—that additional safety analysis is needed. Recognizing when you have a need to vary outside your known safe parameters and doing the appropriate safety analysis—expanding your sandbox—to verify that the variation is safe is called Management of Change. So an efficient and safe experimental design takes into account the widest anticipated variation in parameters—it makes the sandbox as big as possible. 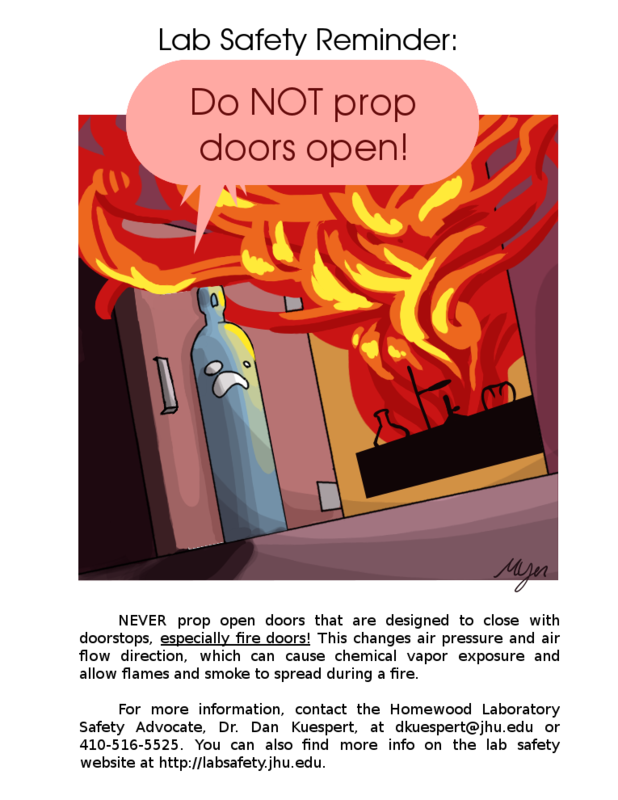 This requires a little thought at the beginning of an experimental series: exactly how hot might you need to operate? Exactly which chemical solvents might you need to use? It takes far less time to do safety checks on a broad scope of experimentation than to do smaller ones piecemeal during lab work—and it is far more likely to be done properly because you won’t be in a hurry to get back to the bench. 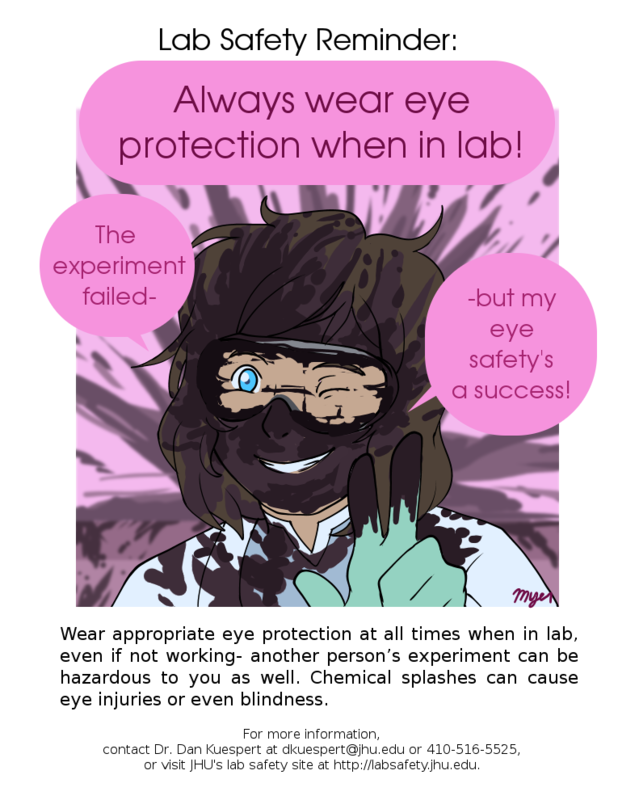 If you would like assistance in safe, efficient, broad-scope experimental design, contact the Laboratory Safety Advocate, Dr. Daniel Kuespert, CSP, at dkuespert@jhu.edu. Laser eye protection is normally rated using continuous-wave, narrow-bandwidth lasers. Nevertheless, some labs use pulsed lasers, which have wider bandwidths and higher peak powers; in the case of pico- and femtosecond pulses, this is taken to extremes. Recent work at NIST and Hood College in Frederick, MD, has shown that much laser protective eyewear is not capable of withstanding fast laser pulses. (J. Laser Appl. 2017, DOI: 10.2351/1.5004090) 22 different pairs of eye protection were tested against a 40-80 fs pulsed laser, and more than half failed to perform as rated. All plastic protective lenses failed. 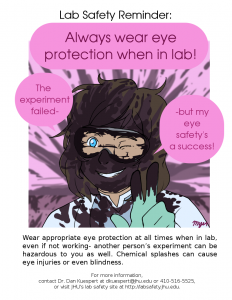 It is strongly recommended that when selecting laser protective eyewear, you test the eyewear against your particular use condition to ensure that they provide adequate protection. The Laser Safety Advocate, Niel Leon, is available to assist with testing of this sort. Further information can be found in the cited paper and in this article in Chemical & Engineering News. 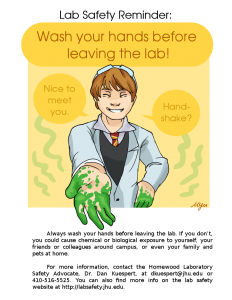 Hazard assessment is an important part of the overall process of controlling hazards in the laboratory. The American Chemical Society recently developed a website that gives detailed information and tools for doing hazard assessments–tools that apply not only to chemistry but to all laboratory research. I encourage all researchers to look at the ACS’s site to see what lessons can be learned. If you would like an introduction to the resources available or a “teach-in” on a particular part (e.g., standard operating procedures–what we call “experimental protocols” in academia), please contact me at dkuespert@jhu.edu. The National Library of Medicine makes available an online short course on toxicology available at https://toxtutor.nlm.nih.gov/index.html. ToxTutor even offers a certificate of completion if you sign up for the Library’s free learning management system. Another good nonspecialist introduction to toxicology is The Dose Makes the Poison: A Plain-Language Guide to Toxicology (Frank, P., Ottoboni, M.A. ; Wiley, 2011). This book provides an excellent introduction to toxic chemical hazards and is recommended for those who handle a variety of chemicals. 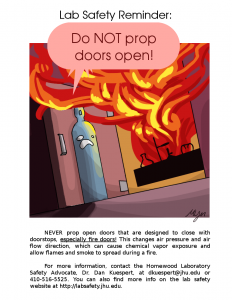 The safety posters below may be used by any JHU laboratory–just print them out and post! 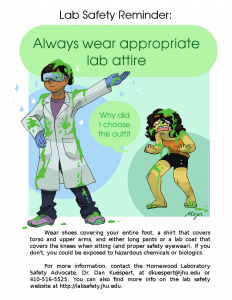 Be sure to choose a poster suitable for your lab. A poster about lab coats is not appropriate in a mechanical lab where lab coats are forbidden (because they might catch on something). 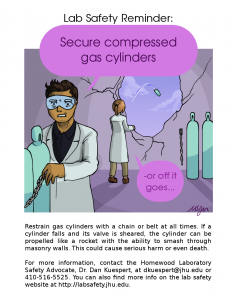 A poster about compressed gases might be a better choice in that case. Rotate safety posters at least quarterly. 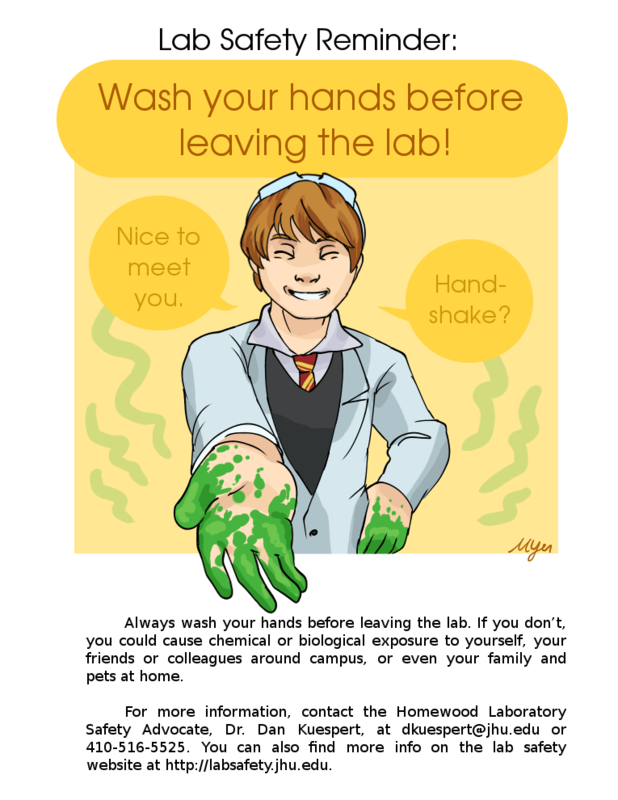 Research shows that posters start to lose effectiveness quickly, so “switching them up” is a good way to keep your fellow researchers safety-aware.